After shooting videos for the outdoor activities with Sony HDR-CX106E, you may like to edit the 1920x1080 AVCHD videos in iMovie 8. However, iMovie 8 does no recognize the .mts files and you could not import the HD videos from CX106 to iMovie for editing. Aunsoft Video Converter for Mac is the recommended Sony AVCHD to iMovie Converter, which can help you to convert 1080i MTS to H.264 MOV for iMovie. And the Sony CX106 AVCHD to iMovie converter will keep the HD 1920x1080 video resolution with fast conversion. To share the experience of converting Sony HDR-CX106E HD videos to MOV for editing in iMovie, here are the simple steps I get the 1080i videos compatible with iMovie on Mac Snow Leopard. Step 1. 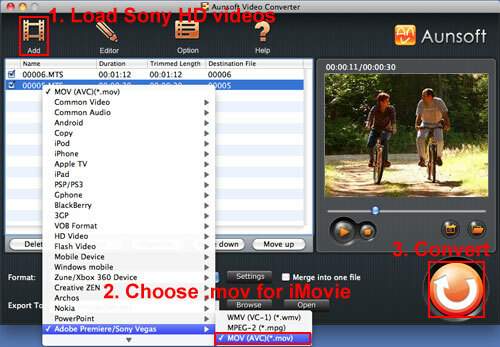 Load Sony CX106 videos to Aunsoft Video Converter for Mac. Connect Sony HDR-CX106 camcorder to iMac via USB 2.0 cable and transfer 1080i .mts files Apple hard drive disk. Run Aunsoft Video Converter for Mac as the best Mac Sony CX106 video converter, and click the "Add" button to load the .mts videos. You can also add videos by dragging and dropping the .mts files to the application UI. To play the videos on the Mac Sony video converter, just select a file from the list and click the play button under the preview window. Click the "Format" option, and navigate the mouse cursor to Adobe Premiere/Sony Vegas > MOV (AVC)(*.mov) as output format. The Mac Sony CX106 to iMovie converter will transcode 1080i MTS videos to HD MOV with H.264 as video codec. Step 3. Convert Panasonic HS700 videos to MOV for iMovie. Click the convert button under the preview window, and the Mac Sony camcorder video converter will start converting Sony HDR-CX106 videos to MOV for iMovie. 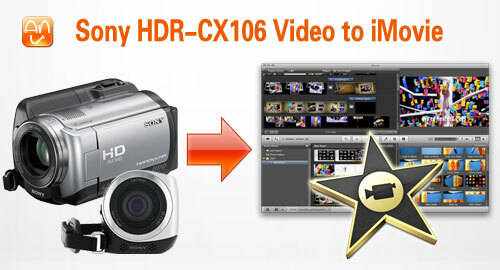 Soon after the conversion, there should be no problem editing Sony CX106E HD videos in iMovie 08 and iMovie 09. 1. I notice that there is remux option on the Sony to iMovie converter. I have not try to remux MTS to MOV yet, but it may work. I will keep it updated after trying the remux option to rewrap .mts to .mov without transcoding. 2. If you are looking for other Sony cameras like HDR-CX350, HDR-XR550, HDR-SR101, DSC-HX5V, Alpha NEX-5 and so on, you may go to the Sony camcorder column for more information and solutions.